Cleveland (September 27, 2017) –The Jazz Age: American Style in the 1920s is the first major museum exhibition to focus on American taste in art and design during the 1920s and early 1930s. Through a rich array of over 300 extraordinary works in jewelry, fashion, automobiles, paintings and decorative arts, featuring the events and people that punctuated the era, the exhibition explores the impact of European influences, American lifestyle, artistic movements and innovation during this exciting period. The Jazz Age: American Style in the 1920s is co-organized by the Cleveland Museum of Art and the Cooper Hewitt, Smithsonian Design Museum, and is on view in the Kelvin and Eleanor Smith Foundation Hall from September 30, 2017 through January 14, 2018. After the First World War, with the postwar map of Europe redrawn and social mores redefined, design influences merged—especially in Paris, Vienna and across the United States. New fortunes, primarily American, fueled self-indulgence and consumption, prompting design featuring vibrant colors, sumptuous materials and a unique sense of freedom. The United States became the leading marketplace for innovative architecture, interior design, decorative art, fashion and music, with industrial design moving into the domestic sphere. The exhibition opens with A New Look for Familiar Forms, providing updated, modern interpretations of older styles of decoration. Émile-Jacques Ruhlmann, Edgar Brandt, Armand-Albert Rateau, Jean Dunand and Raoul Dufy were among those who produced extraordinary objects using lavish craftsmanship, exotic materials and high technical skill, often invoking earlier French styles but with pared-down form. This trend influenced American manufacturers, especially in furniture, while silver and jewelry design forged an important connection between traditional techniques and new influences. Next, A Smaller World explores transatlantic connections that helped blend influences and cultures. Trained designers arriving from Vienna, Berlin and Eastern Europe brought new aesthetics to the United States, especially an interest in industrial design and the American skyscraper. The Persistence of Traditional “Good Taste” features works that show how Americans equated “good taste” and social success with older European styles of design, a trend showcased through some of the finest colonial revival decorative arts produced in America. Antiquing became a national pastime and, along with the purchase of historic reproductions, formed the cornerstone of traditional American decor. Bending the Rules showcases a new ideal for the young modern woman, dictating more revealing fashions and calling for colorful jewelry in exotic forms as well as accessories for cosmetics and cigarette smoking that lent additional glamour and adventure to liberated lifestyles. Fashionable people “stepped out” to nightclubs on both sides of the Atlantic to hear jazz music, which transformed traditional concert venues into dance halls and gave the era a new pulse. Abstraction and Reinvention explores the simple shapes and minimalistic decoration that defined modernism in the first half of the 1920s, as well as the use of bold geometric shapes that took hold in the latter half of the decade. These abstracted and often fragmented shapes were influenced by fine art movements such as Cubism, but they also emanated from architectural sources as diverse as the stepped shapes of ancient Mayan temples, the setback profiles of skyscrapers and the open-plan arrangements of interior spaces, especially those of Frank Lloyd Wright. The final gallery, Toward a Machine Age, highlights the technological and stylistic innovations of the 1920s that became widespread in America by the early 1930s. Modern design of pure form and minimal decoration fit the era’s innovations in new technology and industrial materials, such as tubular steel, rubber, plastics and chrome. Revolutionary advancements in transportation were accompanied by new aerodynamic designs that emphasized speed. The popularity of this aesthetic informed the look of both luxury goods and everyday objects, heralding a new age of machines. More than three dozen objects from The Jazz Age: American Style in the 1920s will be featured on the Reveal and Zoom Wall in ARTLENS Studio and in a curated view previewing the exhibition on the ARTLENS Wall. Works from the CMA’s permanent collection featured in the exhibition can also be found in the ARTLENS App. The app is free to download to iPads or iPhones running iOS9 or higher, or an Android device (4.4+), from the iTunes App Store  or Google Play . Tickets for The Jazz Age: American Style in the 1920s include an audio tour produced by Acoustiguide that offers additional context about this dynamic era of innovation, burgeoning modernity and cultural exchange between America and Europe, including an introduction by William Griswold and extended interpretation for 21 artworks in the exhibition. With floral motifs inspired by Viennese design, an elegant central figure, and strong geometric borders, this monumental screen represents not only the sophisticated taste of Hungarian-born designer Paul Fehér but also the technical prowess of its producer, Rose Iron Works in Cleveland. 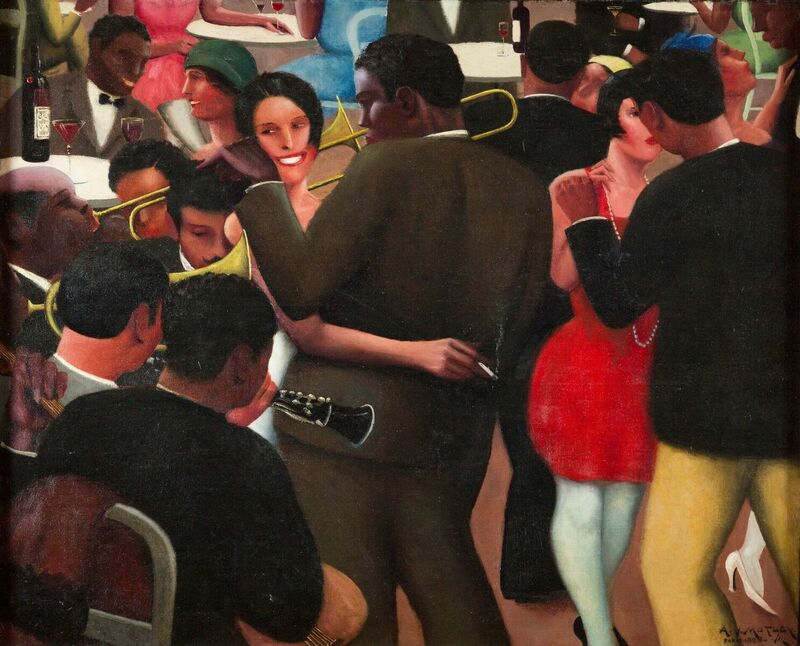 Painted during his time in France on a Guggenheim Foundation Fellowship, Archibald Motley Jr.’s vibrant canvas captures the sights and sounds of a Parisian nightclub frequented by people from West Africa and the West Indies who favored American jazz music. Through his sympathetic and vivid portrayals of daily life, Motley became one of the foremost visual chroniclers of the black experience during the late 1920s and the 1930s. 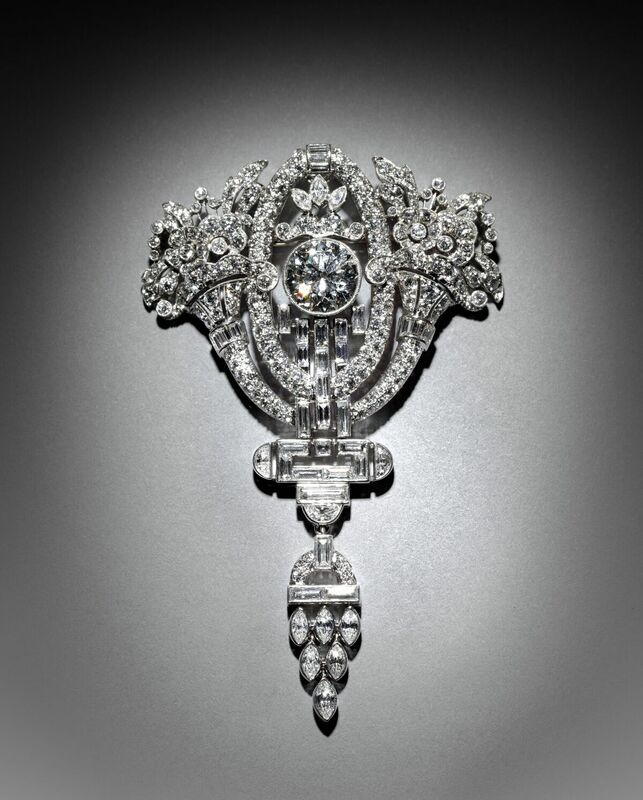 Oscar Heyman in New York fashioned this elaborate brooch in a traditional neoclassical style with floral cornucopia flanking a large solitaire diamond typical of designs during the early to mid-1920s. By the end of the 1920s, flying had become a popular sport in Europe and America where spectators gathered to watch the exploits of daredevil pilots. 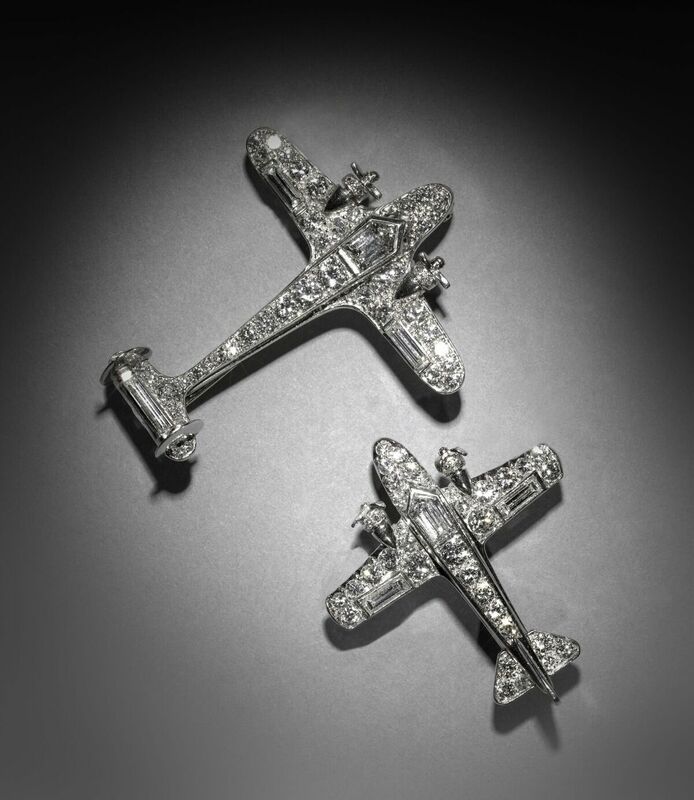 Cartier designed these brooches in the 1930s when flying clubs and air shows abounded. 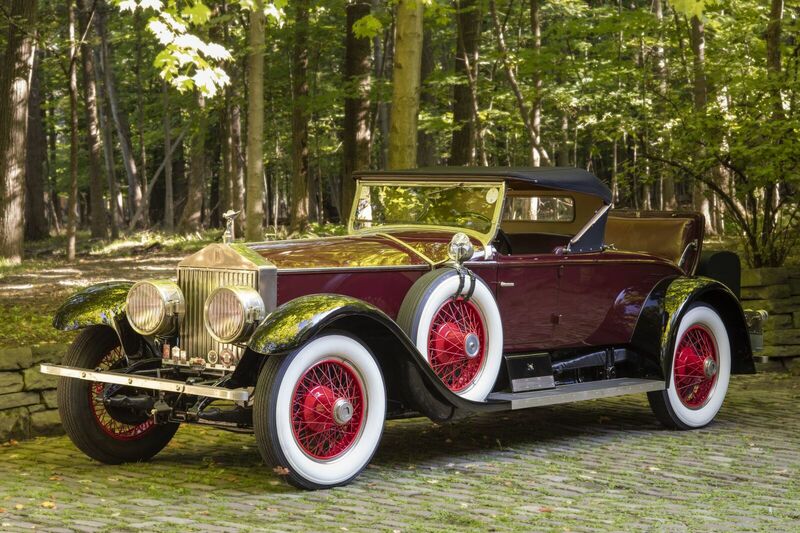 The American market for luxury automobiles grew so rapidly that by 1920 Rolls-Royce had purchased a manufactory in Springfield, Massachusetts, to assemble cars for its wealthy American clientele. The original owner of this roadster was a woman in Rye, New York, who paid over $15,000 for it in 1926. After witnessing the death and destruction of the First World War while serving as a doctor, Goulden turned to artistic pursuits and learned to enamel on metalwork. Eventually his works were shown in salons and exhibitions in Paris, where many Americans encountered his often Cubist-inspired works. Adults $15; seniors and college students $13; children 6–17 and member guests $7; 5 and under and CMA members free. Lavishly illustrated with hundreds of full-color illustrations and featuring essays by Stephen Harrison, curator of decorative art and design at the Cleveland Museum of Art, and Sarah D. Coffin, curator and head of product design and decorative arts at the Cooper Hewitt, Smithsonian Design Museum, The Jazz Age: American Style in the 1920s reveals how designers established a new visual representation of modernity within the context of a changing world. The Jazz Age: American Style in the 1920s can be purchased for $40 softbound/$60 hardbound at the Cleveland Museum of Art store or online by visiting cmastore.org . Jazz music blossomed in a time of upheaval, renewal and transition in all forms of Western life and culture, giving voice and purpose to a new generation and defining a modern age. Produced in conjunction with The Jazz Age: American Style in the 1920s, The Jazz Age CD features a compilation of analog masters recorded between 1920 and 1930 by artists including George Gershwin and Josephine Baker that have been digitally remastered to produce the best possible sound quality. The Jazz Age CD can be purchased for $18.95 at the Cleveland Museum of Art store. The Jazz Age gave way to the Great Depression on October 29, 1929, when the American stock market crashed. The following decade was marked by massive unemployment, deepened by a drought that created the Dust Bowl, transforming tens of thousands of farm families into migrants. Drawing from the museum’s superb holdings of early 20th-century photography, From Riches to Rags: American Photography in the Depression examines photographers’ responses to the social upheaval and economic distress that characterized American life in the 1930s. From Riches to Rags: American Photography in the Depression is on view through December 31, 2017, in the Mark Schwartz and Bettina Katz Photography Gallery. Thursday, September 28, 2017, noon–5 p.m.
Friday, September 29, 2017, 10 a.m.–9 p.m. The Jazz Age: American Style in the 1920s is accompanied by a robust schedule of related programming. For more information and updates, please visit ClevelandArt.org. In the 1920s, the new phenomenon of jazz music reflected the pulse and push of modern ideas against the conventions of the traditional social order. Join us in the atrium each Tuesday in October for a taste of the Jazz Age sound over lunch from the Provenance Café. Saturday, October 14, 1–3:30 p.m.
Jazz Age: American Style in the 1920s celebrates an era of innovation and modernity. Coming just after the First World War, the decade known as the Jazz Age reflected a period of growth and fortune in the United States, attracting an influx of European architects, designers, and craftsmen eager to respond to the demand for new construction. They brought with them ideas of reform that greatly influenced their American counterparts. The result was an eclectic mix of historicist and modernist styles that responded to the changing lifestyles of the times. For this special tour, we will board a bus and explore Cleveland’s 1920s boom in architecture with historic preservationist Ted Sande. We’ll look at public and private structures in and around University Circle, as well as diverse architectural statements from revival styles to Art Deco. Registration is required. Tuesdays at 11 a.m., and Saturdays and Sundays at 2 p.m.
Join Stephen Harrison, curator of decorative art and design and co-curator of The Jazz Age: American Style in the 1920s in the Kelvin and Eleanor Smith Foundation Hall for a series of talks that will explore more closely the main themes of the exhibition. 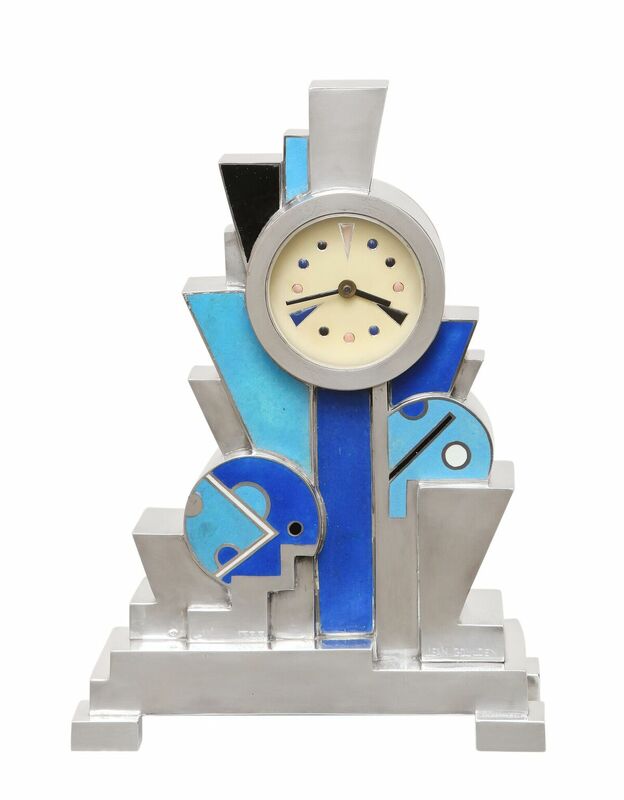 Wednesday, November 1, 6 p.m.
A brilliant age for art and design, the 1920s saw talent and craftsmanship, urbanity and experimentation flow back and forth across the Atlantic. The interaction of American and European-trained designers greatly advanced the modern movement in the United States. Designers in Paris and Vienna were at the core of influential thought and practice. As one of the artistic centers of Europe, Paris was a leader in elegant fashion, jewelry, and interior design. Designers trained in Austria who later immigrated to the United States brought a new aesthetic to American decorative arts. Hear curator of decorative art and design Stephen Harrison discuss how designs from Paris and Vienna grew in visibility in New York and influenced American style in the 1920s in the first three galleries of the exhibition. Wednesday, November 15, 6 p.m.
By the early 1900s, many Americans equated “good taste” and social success with older European styles of design while others preferred early American colonial design especially in the years surrounding the American Sesquicentennial (1926). In the wake of the First World War, a new generation cast off old social customs and embraced a new ideal of modernity, choosing frivolity and fun over the corseted sobriety of their elders. These themes of choice and identity will be explored in a gallery talk by Stephen Harrison, curator of decorative art and design, given in the exhibition galleries. Wednesday, December 6, 6 p.m. While simple shapes and minimal, yet recognizable, decoration spelled modern in the first half of the 1920s, a more geometric style of modernism in design took hold in the latter half of the decade. The use of bold geometric shapes from zigzags to spheres, which would become pervasive in the 1930s, reflected an overall trend toward pure form that had its root in the 1920s. As the Great Depression took hold, these new ideas became a staple of modernist design in the Thirties, moving from the factory into domestic interiors. In this final gallery talk of the series, curator of decorative art and design Stephen Harrison will explore innovation and modernity in Jazz Age design in the last two galleries of the exhibition. Friday, November 3, 6–10 p.m.
Join us for a glimpse back in time at the style, music, and feel of the Jazz Age. Enjoy a selection of specialty cocktails from the era while listening to the inspired stylings of bands Mustache Yourself and the Stokes Jazz Orchestra, in partnership with Tri-C JazzFest. 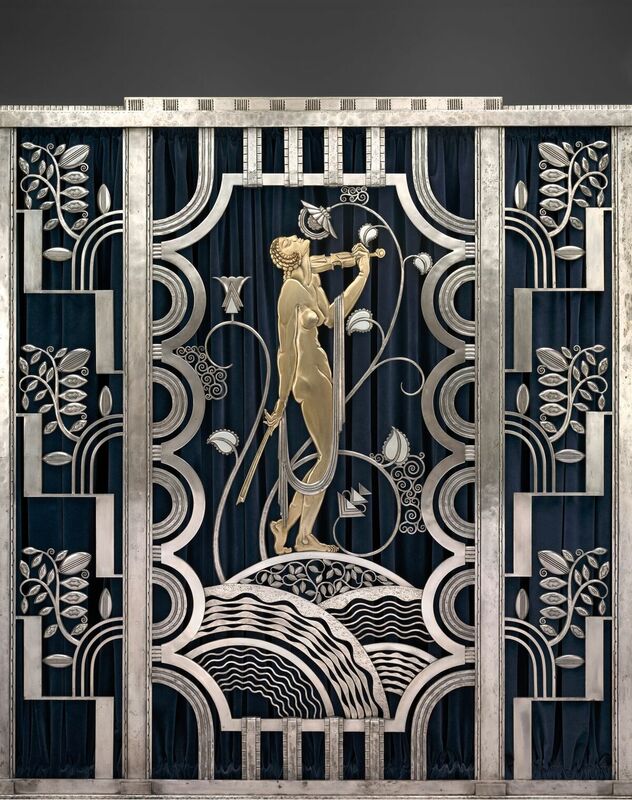 For over 100 years, Rose Iron Works has been a family-owned source for premiere quality decorative metalwork, including the iconic Muse with Violin Screen, currently on view in The Jazz Age: American Style of the 1920s. Join Bob Rose, president of Rose Iron Works, for a tour of the shop and a look into its history. Tickets required. Limit of 30. Register online at by calling the ticket center at 216-421-7350. Wednesday, October 25, 6–7 p.m. In the 1920s, a new woman was born. She could vote, smoke, and determine her own destiny, and she took pride in taking risks and bending the rules. Join us for an exploration of the relationship between fashion and female freedom during the Jazz Age. Focusing on the image of the flapper and her fashions, Einav Rabinovitch-Fox, Visiting Assistant Professor of History at Case Western Reserve University will discuss how women used clothing and appearance as a means for expressing and negotiating their new political, social, and sexual position in the postwar period. The discussion will draw from the current CMA exhibition The Jazz Age: American Style in the 1920s and beyond to examine the important role that fashion played in shaping women’s experiences of modernity by providing a route for claiming power and independence. Wednesday, December 13, 6 p.m. The Jazz Age: American Style in the 1920s celebrates an era of prosperity when the United States became a leading marketplace for decorative art, fashion, music, and architecture. This prosperous decade gave way to the Great Depression shortly after the stock market crashed in 1929. From Riches to Rags: American Photography in the Depression documents photographers’ responses to the social upheaval and economic distress that characterized American life in the 1930s. Hear a dialogue between Cleveland Museum of Art curator of decorative art and design Stephen Harrison and curator of photography Barbara Tannenbaum as they explore common themes and overlapping strands of history in these two exhibitions. The exhibition, The Jazz Age: American Style in the 1920s, features all that glitters and shines in the 1920s. The restless desire for new fashions, new technologies, and new ways of understanding “the good life” permeate these visions, but what we cannot immediately see are the other ways in which the 1920s roared. Racial tensions, class strife, and women’s calls for political recognition also pervade this era. Inaugurating the new CMA educational series What Lies Beneath: Seeing the Unseen in Works of Art, Beyond the Glamour is a panel discussion that considers in particular how race and inequality, while not seemingly present on the surface of these works, ghost their glimmer. During the 1920s, sheet music and recordings brought popular songs of every subject and style into homes and music venues across the United States. This program will focus on the evolution and style of popular sheet music, which represented a mix of music, design, literature, and photographs of Jazz Age artists and bands. Daniel Goldmark, professor and director of the Center for Popular Music Studies at CWRU, will share vintage sheet music, talk about the novelty, humor, and risqué nature of popular tunes of the era, and share period recordings. Enjoy live performances on the ukulele, a popular instrument of the Jazz Age. Free; ticket required. Limit 35. Register online at engage.clevelandart.org or by calling the ticket center at 216-421-7350. In conjunction with The Jazz Age: American Style in the 1920s, we liven up the joint with Butler, Bernstein & the Hot 9—a rip-roaring combo led by the remarkable pianist Henry Butler and the irrepressible trumpeter Steven Bernstein. With a nod to the Hot Five and Hot Seven bands of Louis Armstrong, the Hot 9 takes the early jazz of the 1920s as its starting point. Butler and Bernstein first worked together in 1998 in the Kansas City All Stars. They reunited in 2011 for a concert in New York City, and the material they performed—including the classic blues of Bessie Smith and the first-generation jazz of Jelly Roll Morton—resonated in a way neither had expected. “Their collaboration is both historically aware and fully prepared to cut loose,” remarked the New York Times. Their music is filled with modern flavors, agile arrangements, and a vitality that never allows the historical focus to limit itself to mere re-creation. Shown in Morley Lecture Hall unless noted. Each program $10, CMA members $7. Recently restored 1920s silent classics from France, Germany, and the US. Sunday, October 1, 1:30 p.m., Tuesday, October 3, 1:45 p.m. Directed by Fritz Lang. Here’s the most complete version of Fritz Lang’s visually staggering futuristic epic, containing 25 minutes of lost footage newly discovered in 2010! It tells of a gleaming, wealthy modern city powered by poor, dirty subterranean laborers and machines—and of an evil, messianic robot who foments a destructive workers’ revolt. Silent with music track. (Germany, 1927, English intertitles, b&w, 148 min.) Gartner Auditorium. Screenings co-sponsored by the United Labor Agency; card-carrying union members $7. Friday, October 13, 7 p.m. Directed by Robert G. Vignola. Marion Davies, ace comedienne and protégé/paramour to William Randolph Hearst, plays a millionaire’s spoiled daughter who is whipped into shape by the actor playing Petruchio in a local production of The Taming of the Shrew. This delightful silent comedy is best remembered today for its Art Deco production design (sets, costumes, lighting) by prominent designer Joseph Urban. Chicago jazz pianist David Drazin will provide live musical accompaniment. Preserved by the Library of Congress. (USA, 1921, b&w, 35mm, 82 min.) Live music accompaniment by David Drazin. Friday, October 20, 7 p.m., Sunday, October 22, 1:30 p.m.
Sunday, October 29, 1:30 p.m., Tuesday, October 31, 1:45 p.m.
Saturday, November 4, 5 p.m., Sunday, November 5, 6:30 p.m. Directed by John Murray Anderson. With Paul Whiteman and His Orchestra, Bing Crosby, et al. Paul Whiteman, a hugely popular bandleader of the 1920s who was dubbed “the King of Jazz” by the white media, is the ringmaster of this entertainment extravaganza that includes comedy sketches, novelty acts, an animated cartoon, and a performance of Gershwin’s Rhapsody in Blue (commissioned by Whiteman). Shot in an early two-strip Technicolor process, this classic revue film has been beautifully restored. (USA, 1930, color, DCP, 100 min.) Co-presented by the Cleveland Institute of Art Cinematheque and shown in the Peter B. Lewis Theater, 11610 Euclid Ave. Both films shown Sunday, November, 12, 1:30 p.m., and Tuesday, November, 14, 1:45 p.m.
Sunday, November 26, 1:30 p.m., Tuesday, November 28, 1:45 p.m.
Sunday, December 10, 1:30 p.m., Tuesday, December 12, 1:45 p.m.